General Lee Super Clean 4 speed #'s matching YEEEEE HAW! 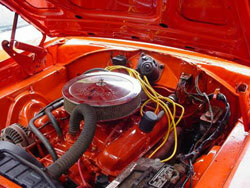 HEADTURNING 69 GENERAL LEE 4 SPEED #'S MATCHING FROM THE FACTORY! SWEEET SHINY NEW PAINT JOB WITH NOTHING BUT THE BEST AND DONE BY THE BEST! SUPER SOLID OKLAHOMA CHARGER! NICE TAN INTERIOR WITH HURST SHIFTER! NEW WHEELS AND TIRES! DETAILED WITH A FINE TOUCH OF PERFECTION!